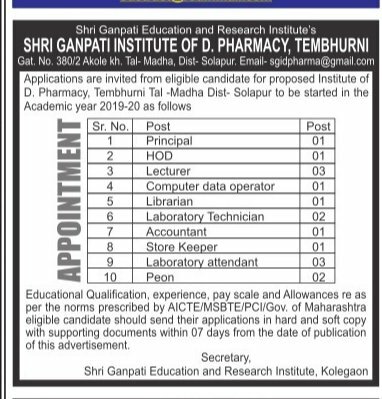 SGID Pharma Solapur (Shri ganpati Institute of D.Pharmacy Tembhurni), Solapur published a new job notification for Principal, HOD, Lecturer, Computer Data Operator, Librarian, Lab Technician, Accountant, Store Keeper, Lab Attendant & Peon Posts. The recruitment is for total 16 Vacancies. The willing candidates are informed to see the latest notification March 2019. Last Date of offline application is 25-03-2019. For More details of SGID Pharma Solapur Recruitment 2019 Read Below. Interested & Eligible candidates can send their application along with all the necessary documents and testimonials to Shri ganpati Institute of D.Pharmacy, Tembhurni, Solapur. Application starts offline 18-03-2019. Last Date of application is 25-03-2019.